Although summer heat and drought continue unabated, the quality of sunlight at dawn and dusk has changed. First, dawn is coming later, dusk earlier. But also the angle of the light is changing. Now the sun’s rays spend more time slanting through the trees, golden arrows that spotlight lichen-covered bark, a bit of mossy ground, or a bright cardinal posing on a branch. 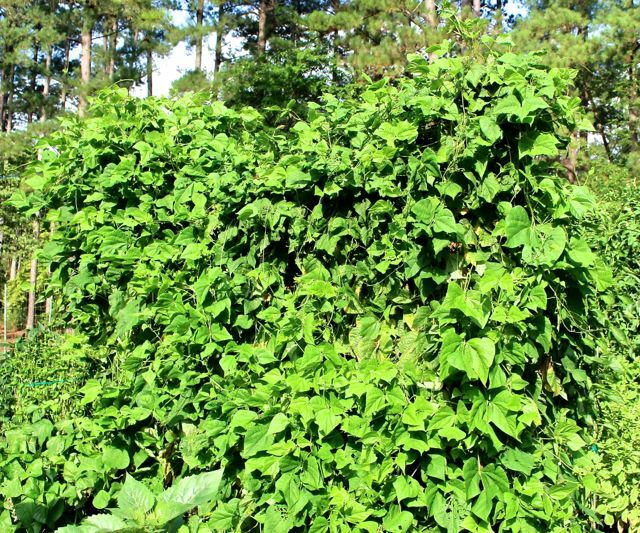 Both pole and bush beans are losing leaves to time and fungus, but still their growing tips actively push out new shoots and flowers. I’m doling out water to them from the shallow well about every third day, and picking tasty beans about as often. It’s been a good year for the beans. The tomatoes are also still producing, albeit much less enthusiastically. As usual, Sweet Treats cherry tomatoes win the prize for prolonged productivity. 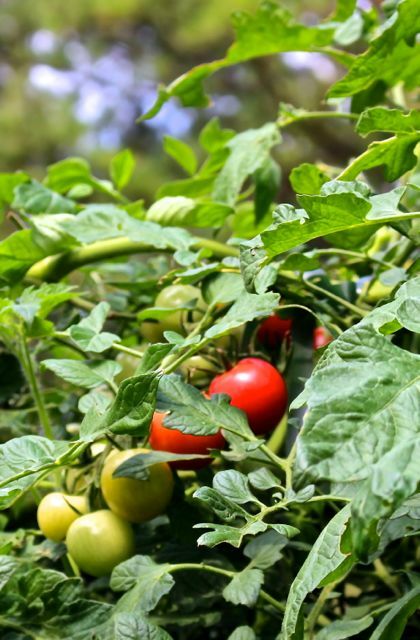 If I could give them more water, I’m sure they would produce even more heavily, but a handful of fruits every other day is more than enough to quell our tomato hankerings. Last weekend at the local farmers’ market, a gentleman was selling vigorous seedlings of a number of broccoli, chard, and collard varieties. I never get around to starting fall crops in time, because my little greenhouse is too hot this time of year. I couldn’t resist the healthy broccoli babies. I got 6 Packman — a southern standard in these parts — and 6 Arcadia — a variety I’ve never tried that is supposed to be very cold-resistant, thereby extending the broccoli season into late fall — theoretically, anyway. We love fall broccoli at my house, because the frosts seem to sweeten them, but there’s a fine line between frost and freeze, and you can’t always predict when that line will be crossed. Enter my little tent above. Yesterday, I planted my broccoli babies, mulched them with compost, and watered them very, very thoroughly. I draped spun garden fabric over metal hoops to enclose the plants completely. Right now, that’s mainly to keep out the cabbage moths that love to lay their eggs on broccoli, resulting in green loopers chomping the plants to stubs. 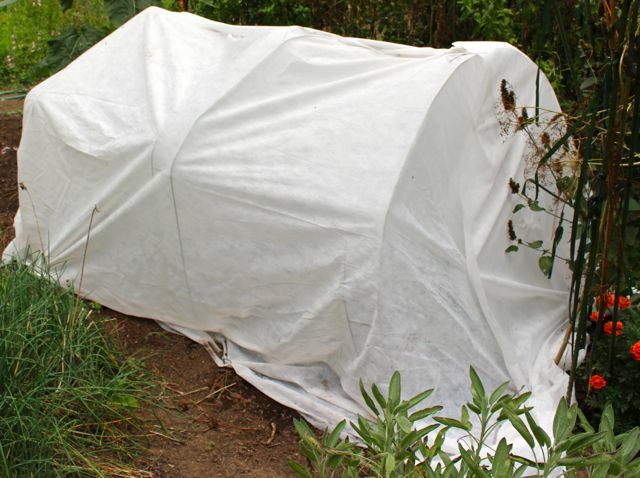 As cooler temperatures arrive, the tent will protect the plants from frost damage; sometimes it even deflects the first few freezes. I leave one side loosely tacked down so that I can lift it easily for watering, because even though the fabric does let water through, much does bounce off. And the rains continue to avoid my house anyway. We are so very dry here that it hurts me to walk around the yard and see all my suffering, wilting green friends. 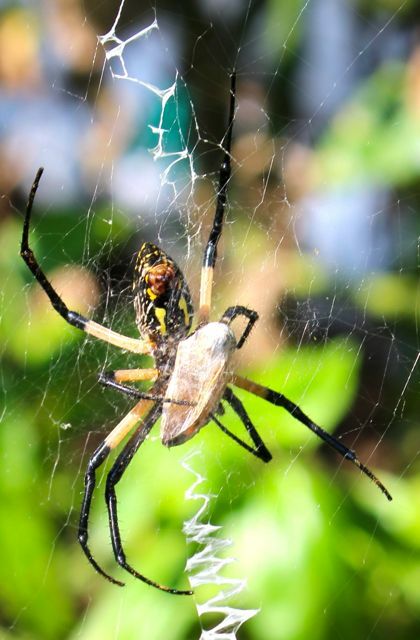 The Writing Spider whose web was draped parallel to the tomato trellis relocated herself. Now she has anchored her home to the trellis on one side and a tall basil plant on the other, stretching across a garden path to optimize her chances of catching unwary fliers. I think it’s working for her, as you can see. 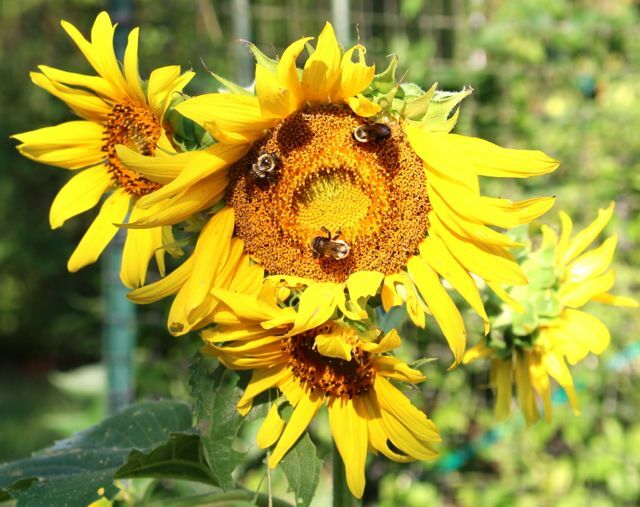 Of the five sunflowers (Sunflower ‘Birds and Bees’ from Renee’s Garden) that managed to grow for me this dry summer season, four produced single large flowers on top of their stalks, while this one, which bloomed last, produced multiple, smaller heads. The pollinators seem to feel that size doesn’t matter. A few insect species that I normally see by June have only just recently appeared in my garden this year. Case in point: Black Swallowtails and their caterpillars. 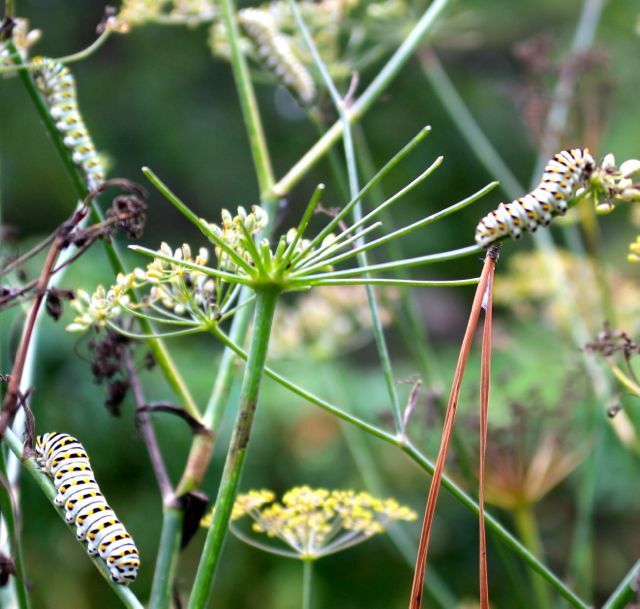 Finally, the bronze fennel I plant especially for their caterpillars to dine on is covered in these colorful, voracious critters. 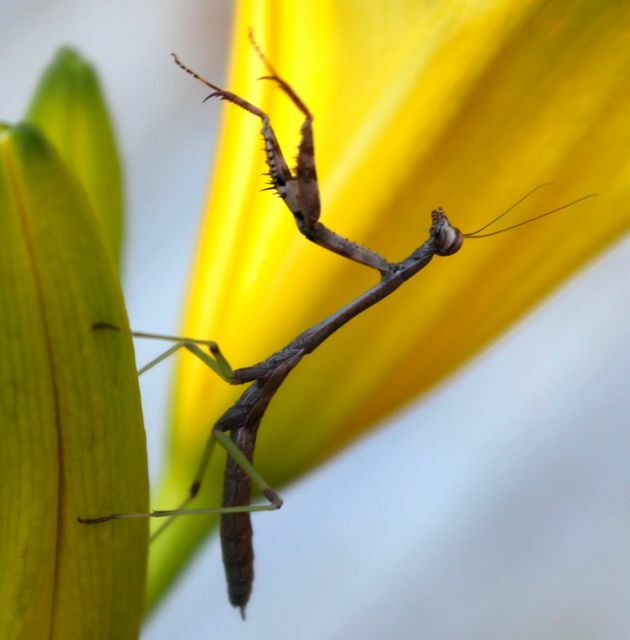 After only seeing the Chinese mantises all summer, I was quite relieved to spot this native Carolina Mantis staked out on my Autumn Daffodil daylily in the front garden. They are much smaller and differently colored. This one did not like being photographed and kept jumping about, hence the slightly blurred photos. That’s the tip of a daylily petal, so you can see how relatively small this one was. 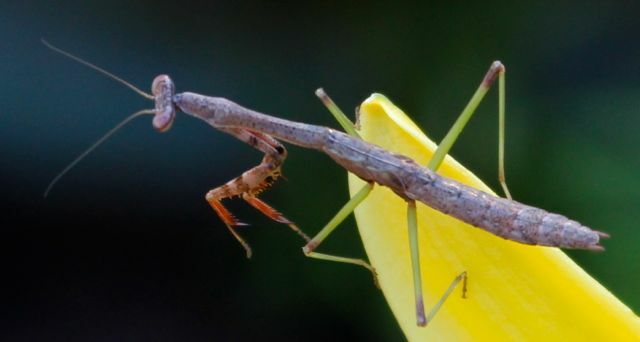 I don’t think it was full-grown, but this species never attains the size of the Chinese mantises that often displace them from their preferred habitats. 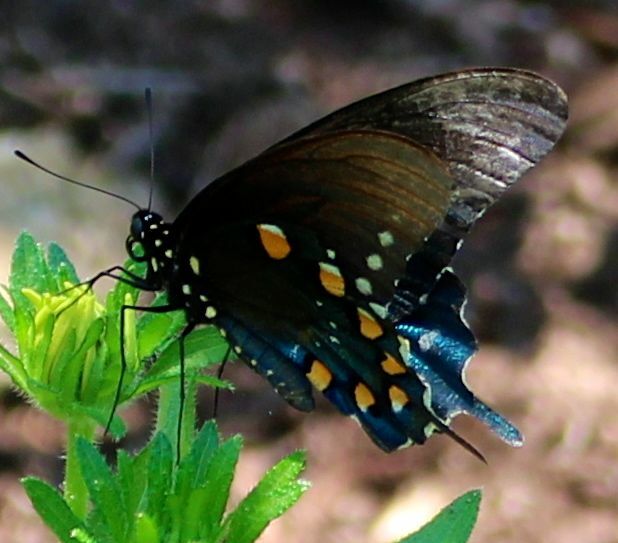 The most abundant dark swallowtail butterfly in my yard is the Spicebush Swallowtail, probably because the shrub for which it is named grows all over my yard. 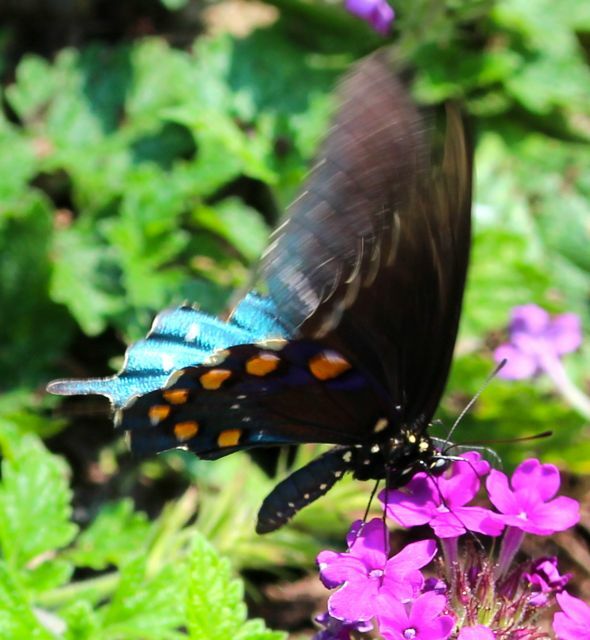 Finally yesterday I spotted my first Pipevine Swallowtail. The shimmery blue of their hind wings is unmistakeable, but it is very hard to get a decent photo of them, because they drink nectar while hovering — just like hummingbirds. In photo after photo, I end up with motion-blurred wings. The blue hind wings shimmer like water dancing in sunlight. I planted some native pipevines two years ago in the hopes of attracting more of these beauties. I suspect the drought may have damaged them; I’ve been afraid to look, because I just don’t have any water for them. Golden wings of this dragonfly shimmered in the sunlight too. 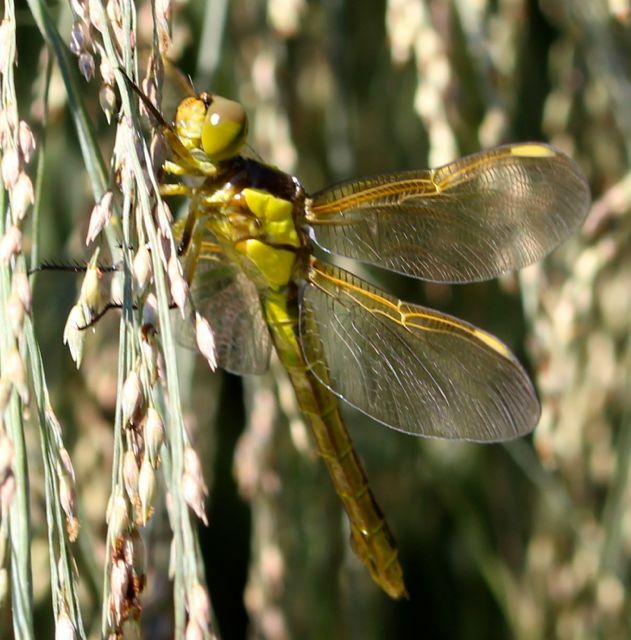 This dragonfly showed up a few days ago and posed on one of my ornamental grasses. I’ve never seen dragonfly wings edged in gold before. Formosa lily blooms signal summer’s waning. 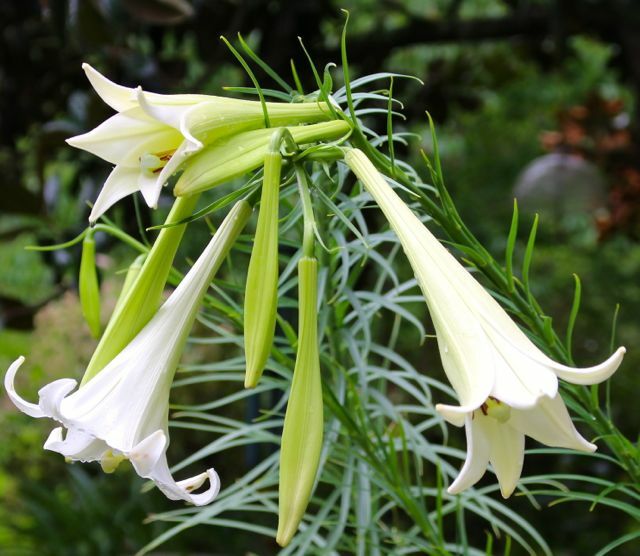 Tall Formosa Lilies lean from the weight of their enormous white trumpets. Their sugary fragrance perfumes the humid morning air. I’ll close with this somewhat fuzzy shot. The point here is that I managed to get two Eastern Tiger Swallowtails in one photo. For most of the summer, even this common species has been sparse. 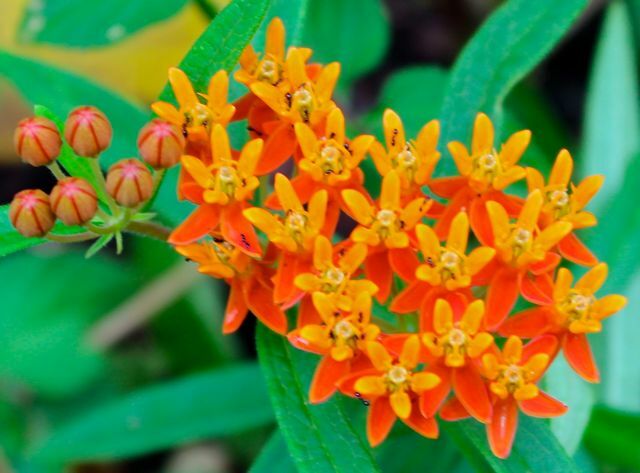 Finally, in the last week, they are everywhere, drifting from blooming abelia to bright lantana to Joe Pye Weed and Cardinal Flower. Finally, I am having to walk carefully to avoid colliding with these floating lovelies. It’s been a long, dry summer, and we’ve more to go before autumn arrives. It lifts my spirits to see these recent arrivals. Better late than never, as the saying goes. Now if we can just persuade that tropical system out in the Atlantic Ocean to send its moisture — but not its winds — our way, that would be a fine ending for this season, and a great opener for the next. This entry was posted on August 18, 2015, 3:24 pm and is filed under Favorite Plants, Native Wildlife, piedmont gardening, Vegetable Gardening. You can follow any responses to this entry through RSS 2.0. You can skip to the end and leave a response. Pinging is currently not allowed. Thank you for the wonderful cherry tomatoes. Something planted them by my roses and it is a huge plant with great fruit. I could not stand to pull out a healthy volunteer and it is giving us the only tomatoes of the year so far. If I had known it would be as large as it is, I would have put in bigger supports. It must be over 6 feet! My pots are just beginning to have ripe fruit. 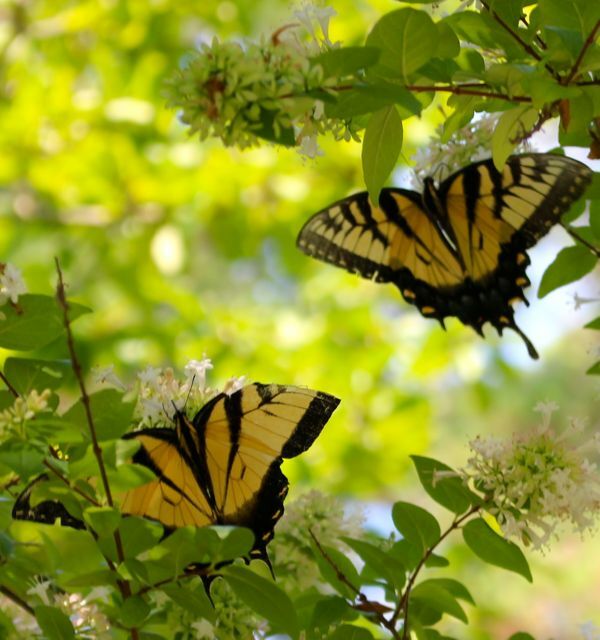 I also thank you for writing about the miniature crepe myrtles in your newspaper column. I bought a couple a few years ago and they are finally blooming. Plants can wander from where they started, thanks to squirrels and/or birds, most likely. I’m glad this stray worked out for you, and that you’re enjoying all your plants.